The 19th century witnessed many great advances in the medical profession, but despite this thousands of people were constantly in ill health and needed to take medicines on a daily basis. Local chemists would produce their own tinctures and mixtures, making pills and tonics for a wide variety of different ailments. 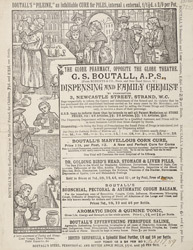 This can be readily seen on this leaflet, which advertised many of proprietor GS Boutall's own products.